This winter, Bogie’s Place turns two-years-old, and yet the casual, 1920s-inspired steakhouse remains mostly an industry secret. Roped off behind the bar of JM Curley, the secluded, darkly-lit chophouse feels like an intimate sanctuary compared with the raucous atmosphere outside. A heavy burgundy curtain lies between the 20-seat restaurant and its more lively cousin. The only thing to tip off the uninitiated is the small gold Bogie’s placard and the art deco signage proclaiming “Adults only. Please no cell phone use.” It’s so discreet, general manager Kevin Mabry says most people first discover it while searching for the bathroom at JM Curley. Co-owner Andy Cartin came up with the name and the concept of Bogie’s Place from a cherished childhood memory. His favorite place to dine out in West Hartford, Connecticut was a pizza parlor with a secret gentleman’s club in back. Cartin says he was enamored with the padded leather parlor doors, the stench of cigar smoke wafting out, and the sound of ice clinking in highball glasses. Besides the circular booths filled with Scotch-swilling gentlemen, the one thing Cartin could see from his vantage point, staring at him whenever the doors swung open, was a cardboard cutout of Humphrey Bogart. As chef Chris Bauers says, “Walking through that curtain, it feels a world away from the rest of the dining room.” And Bogie’s works hard to maintain that cloistered, otherworldly feel. In fact, the BiNA Hospitality Group, the restaurant group behind JM Curley and Bogie’s, wouldn’t allow us to photograph the interior. They’ve worked hard to maintain its provocative mystique. So, to get a glimpse of its diminutive private bar, its selection of jazz records, and its studded-leather booths, you’ll just have to venture in yourself. But we can talk about the amazing food and drinks. Here are four reasons why you should check out the largely uncharted, turn-of-the-century steakhouse known as Bogie’s Place. Crispy shoestring fries, smashed new potatoes with gobs of butter and sour cream, bread pudding, and upcoming specials like a classic Waldorf salad with Boston leaf lettuce, apple slices, and raisins. Chris Bauers has cultivated an irony-free approach to classic steakhouse fare, something that feels surprisingly modern and graceful in his hands. 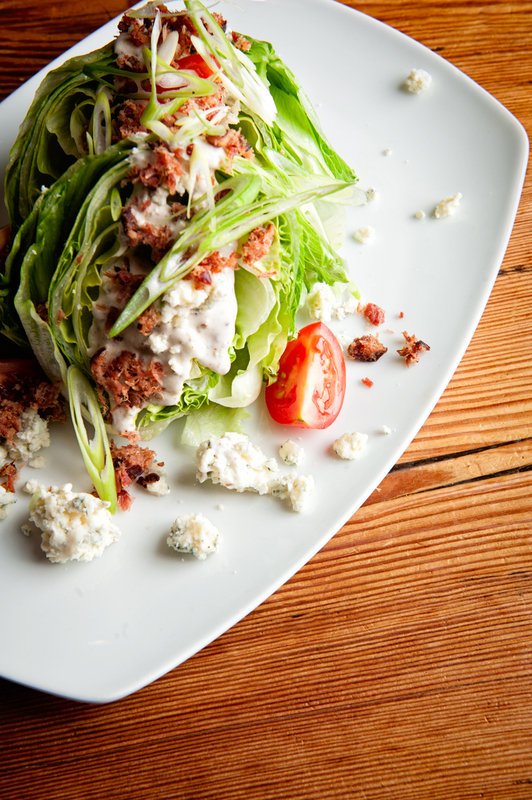 Bauers’ love of all things vintage is never more apparent than in his treatment of that time-honored staple, the wedge salad: a generous chunk of iceberg lettuce dressed with Maine cherry tomatoes, scallions, and a Great Hill Blue cheese dressing. But it’s the additions of cayenne, lemon juice, and North Country Smokehouse bacon that adds an addictive, well-balanced punch of smoke, heat, and umami. With its house-made orgeat, bitters, and tonics, it’s obvious that JM Curley is firmly entrenched in the growing craft cocktail culture. 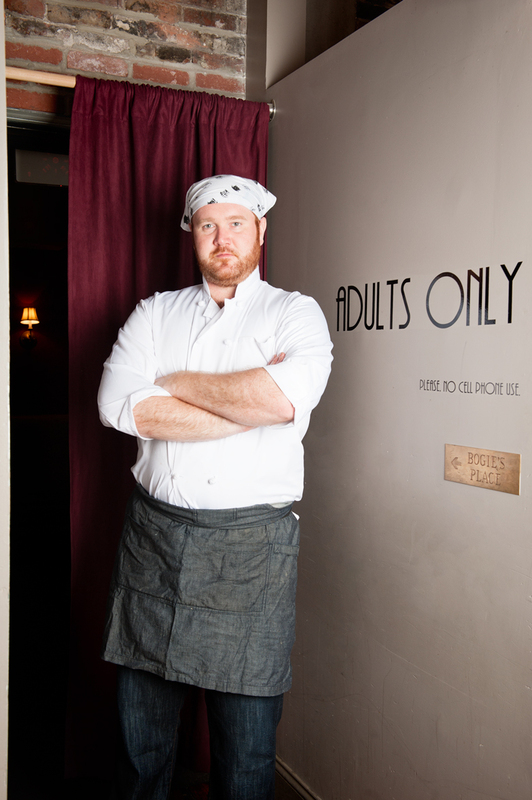 But with Bogie’s bar program, Kevin Mabry wanted to go in a much different direction. 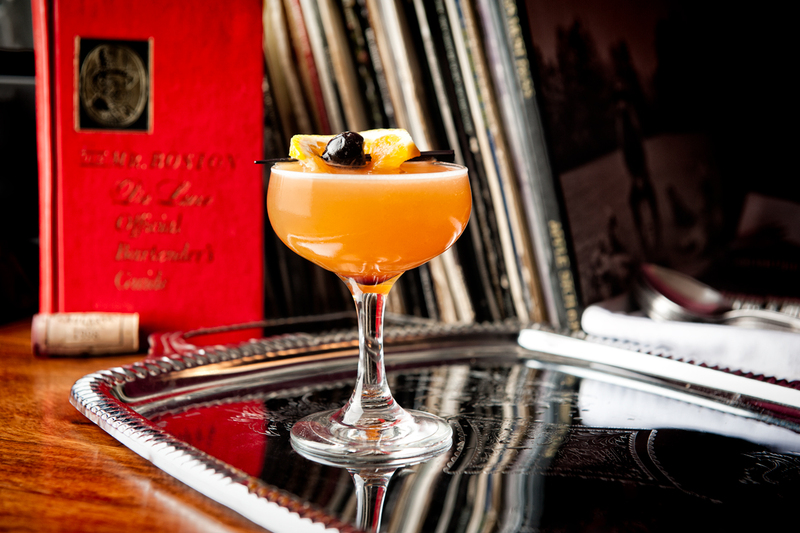 For one, Mabry was determined to showcase the Ward 8 (rye, lemon juice, orange juice, and grenadine), an homage to the recently closed Locke-Ober, the Gilded Age restaurant that first conceived the cocktail back in 1898. 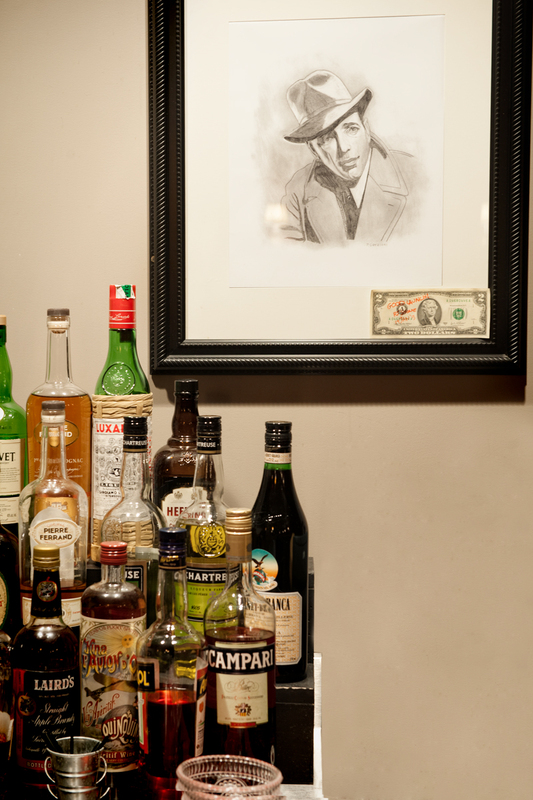 The rest of his highly curated menu follows suit, with the type of libations (i.e. a White Russian and a French 75) one might have seen in Locke-Ober’s heyday. Perhaps the most exciting part of Mabry’s cocktail list is an a la carte, build-your-own martini service. Choose from several types of vodka and gin, top it with an artisanal vermouth like French aperitif Kina L’Avion, and finish it with accoutrements such as a sachet of herbs or Bauers’ arsenal of house-made pickles. The crowning touch? Your customized martini is poured tableside, another chic throwback to the Locke-Ober days of yore. 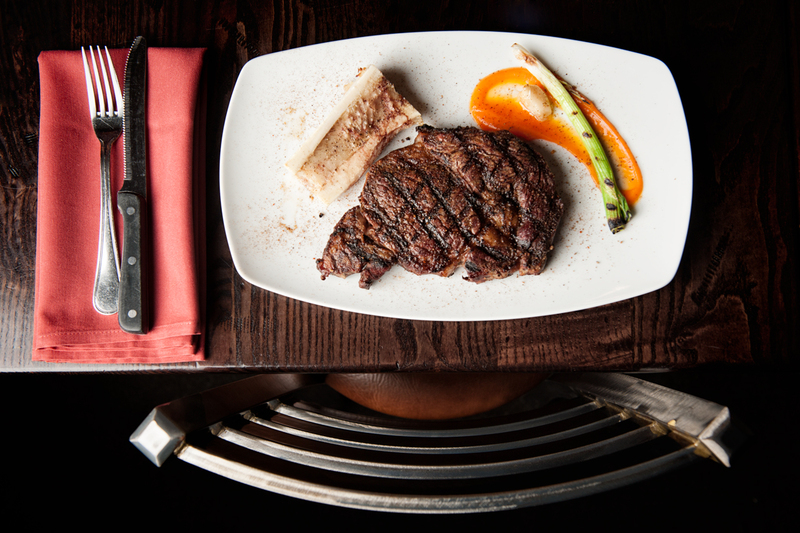 Bogie’s provides decadent cuts of beef without requiring an expense-account budget: dry aged New York strips, grass fed tenderloins, and hulking 30-ounce porterhouses, all sourced from local meat purveyors, Kinnealey and William & Co. Even better, you can dress up that grilled rib-eye with bone marrow, foie gras butter, and other drool-worthy options from Bogie’s lavish “Hook it Up” menu. Steaks take top billing at Bogie’s, but it’s the $120 caviar service that remains its most extravagant showpiece. 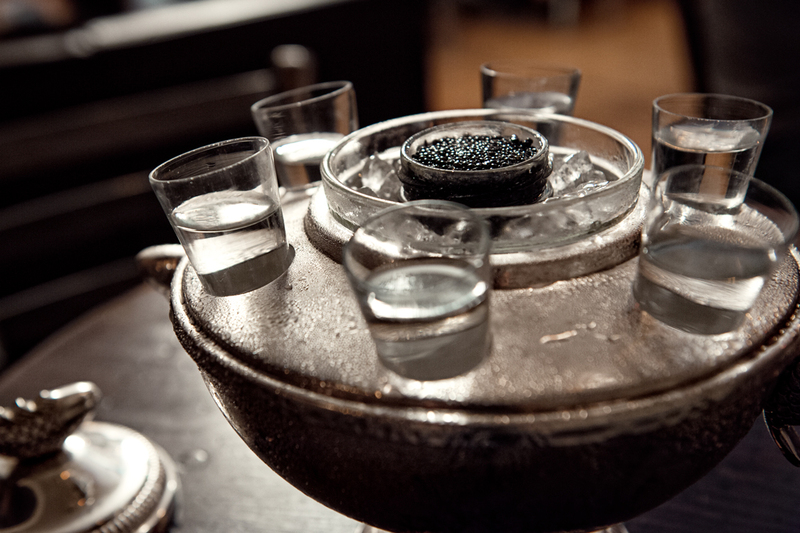 A dewy Victorian server is laden with six shots Fair quinoa vodka and a one-ounce portion of American sturgeon roe. The czar-like spread comes with a platter of blinis and garnishes like finely chopped red onion, sour cream, chives, egg yolk, and egg whites. But Bauers is in the process of updating his most posh offering. To match the modest, laid-back vibe of Bogie’s, the chef is going to start offering alternatives like paddlefish caviar and and a less expensive wild sturgeon roe. 21 Temple Pl., Boston; 617-338-6333 or bogiesplace.com.